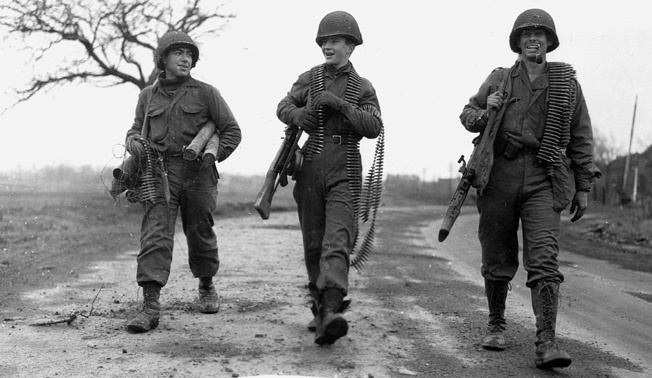 American soldiers satisfied their curiosity about German equipment by examining captured enemy weapons, sometimes turning them on their former owners. 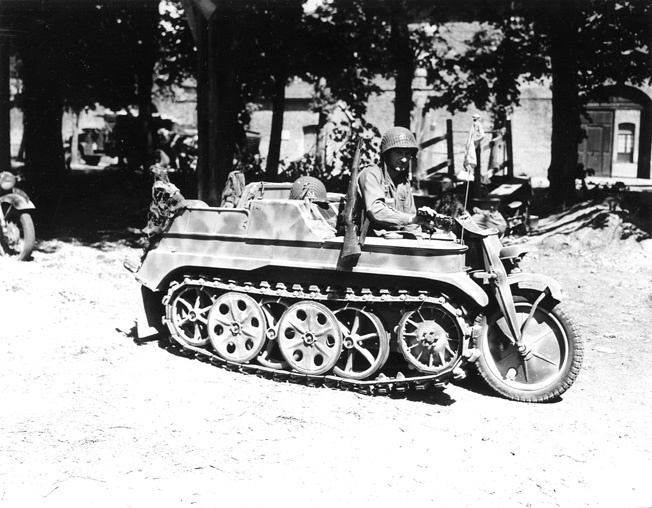 A paratrooper with the 101st Airborne Division tries out a German half-track motorcycle, known as a kettenkrad, in Carentan, France. 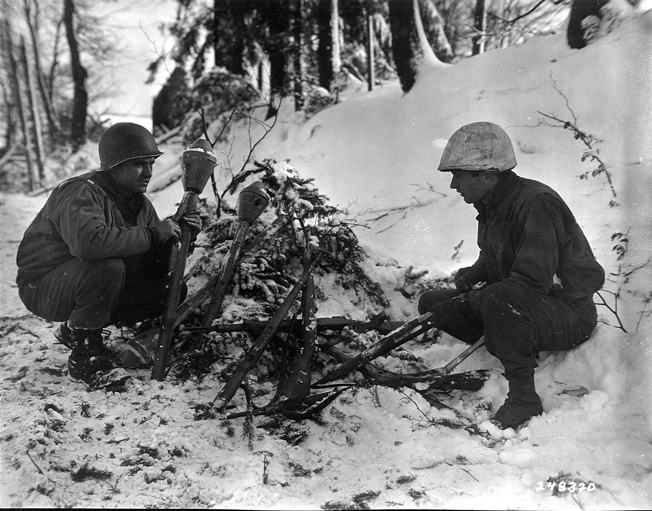 Soldiers from the First Infantry Division examine rifles and Panzerfausts left behind when the Germans were forced out of Schoppen, Belgium in January 1945. 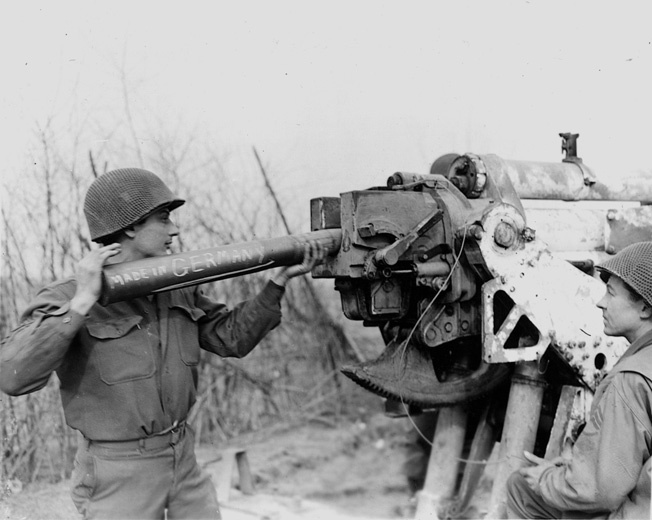 Turning the enemy’s own 88mm gun on them, a soldier loads the notorious weapon with a shell inscribed “Made in Germany” and prepares to fire across the Rhine River. 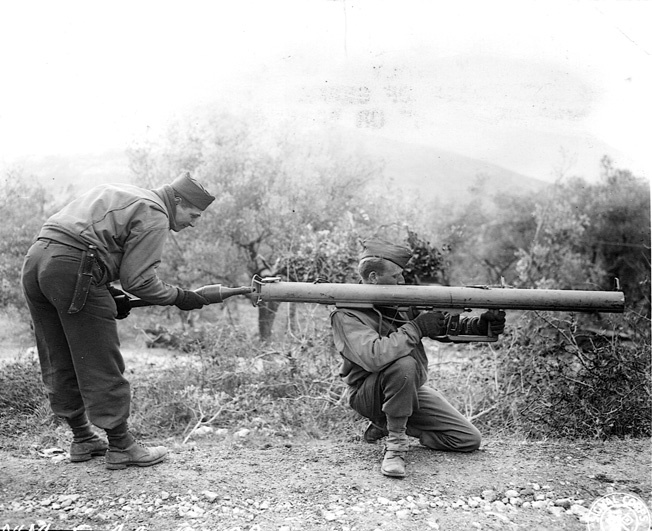 Americans try out a German antitank weapon in Ceppagna, Italy, in January 1944. 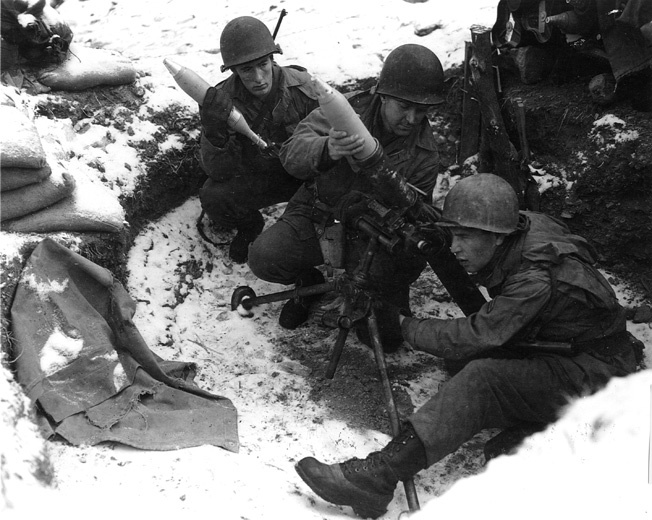 Americans fire a captured German mortar toward enemy positions. 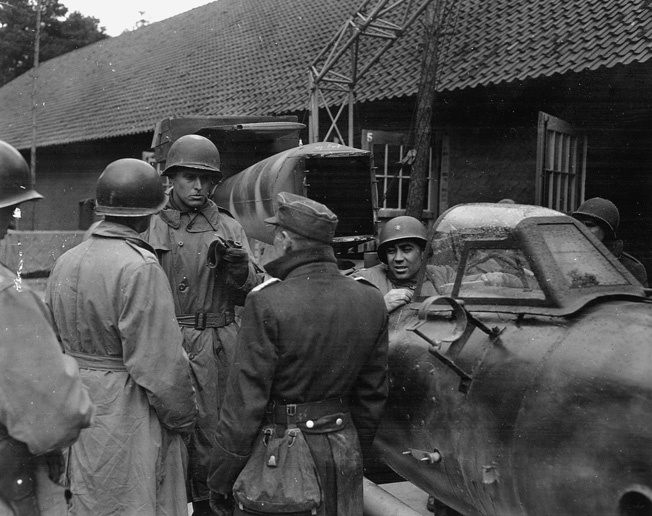 Soldiers of the 5th Armored Division examine a German V-1 suicide bomb. 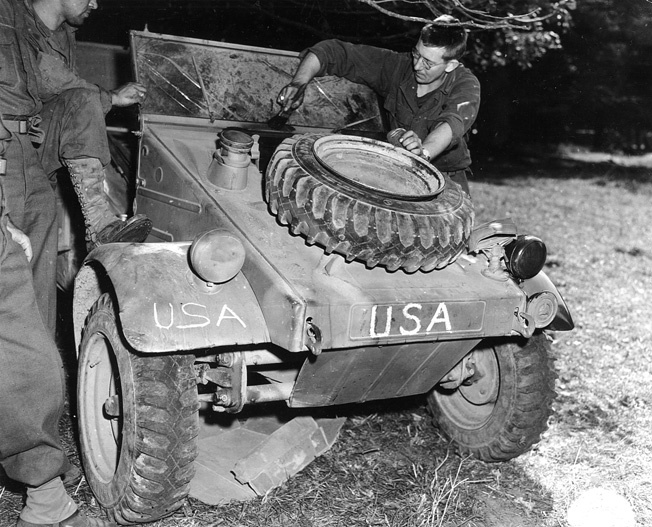 A soldier repaints a captured German vehicle which will then be used by the U.S. Army’s 28th Division in Saint Manvieu, France. Three soldiers laden with captured weapons and ammunition head for a pit near Gurzenich, Germany, where they will have an opportunity to test fire the weapons. 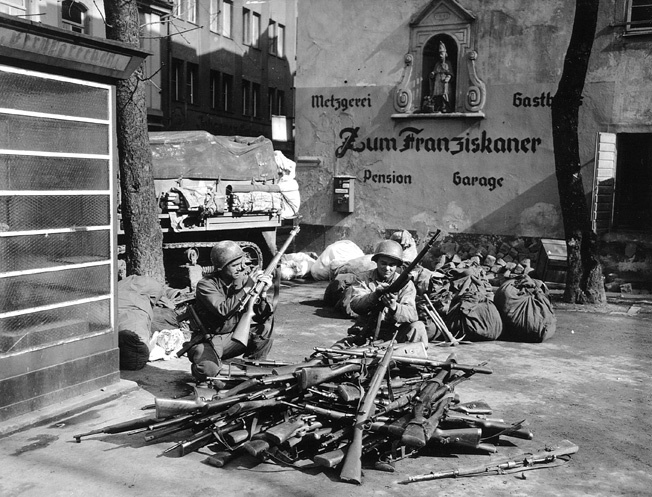 Captured German rifles taken by the 11th Armored Division are examined by American soldiers, March 13, 1945, in Andernach, Germany. 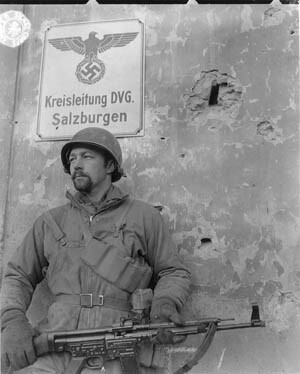 Sergeant Oakly M. Rath holds a captured German Sturmgewehr 44 in front of a chateau in Salins, France. 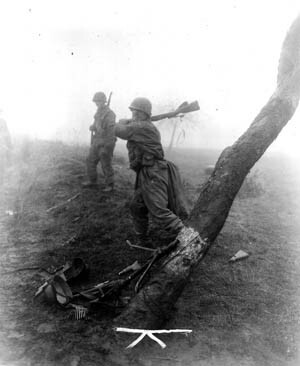 To insure these captured German weapons won’t be used again, a soldier of the 10th Armored Division breaks them against a tree, March 7, 1945. Tags 88mm gun, Allies, Axis, Italian Campaign, Kettenkrad, Kubelwagen, Mauser rifle, Mediterranean, MG 42, Nazi Germany, Panzerfaust, Rhine River, Sturmgewehr, U.S. Army, V-1 flying bomb, wehrmacht.